The announcement also quotes IPCom's Managing Director, Bernhard Frohwitter, as saying that the patent holding firm, which acquired this patent (as well as more than 1,000 other patents) from wireless communications pioneer Robert Bosch GmbH, "will use the right awarded by the courts, likely resulting in HTC devices disappearing from shops during the crucial Christmas season". HTC considers that the appeal had become redundant as the German Federal Patents Court had previously held the relevant claim of the patent to be invalid. Based on my research, there's nothing "redundant" here. The German Federal Patent Court (BPatG) ruling HTC refers to does not have legal effect right now -- unlike the permanent injunction order -- because both parties appealed it to the German Federal Court of Justice (BGH). A BGH decision on the BPatG findings is probably going to take another two years (roughly). In the meantime, IPCom can and, according to credible information that I have obtained, indeed will ask the Mannheim court to enforce the injunction. While HTC can try to oppose the enforcement of the injunction, my research shows that the odds are very long against HTC on this one. IPCom does not have to post a bond at this stage. It posted a bond of 1 million euros in 2009, which it can now revoke, and it can claim damages (for patent infringement and the cost of the proceedings) against HTC, including but not limited to a 7.5 million euro bond HTC posted (in 2009 as well). Should the asserted patent claim (claim 11 of EP1186189) ultimately be found invalid, HTC could theoretically sue IPCom for damages, but it would face an incredibly high hurdle under German law. HTC would have to prove that IPCom "behaved unethically", and the Federal Patent Court ruling, even if affirmed, would hardly enable HTC to satisfy that criterion. Damages would only be likely if the patent claim was found invalid in its entirety, as opposed to just being narrowed (IPCom amended the claim in the proceedings before the BPatG but is still, in the appeal before the BGH, defending the validity of the original version). It appears that HTC's real motivation is a different one from the one it cites. It's not about EP11886189, with respect to which HTC now got the worst possible outcome at this stage. 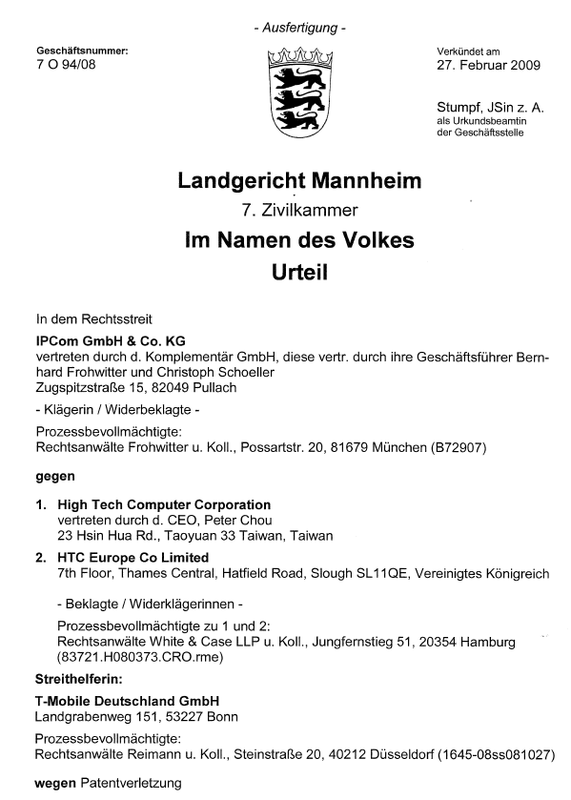 What HTC apparently wanted to avoid is a defeat with respect to two other IPCom patents that would have been at issue at the Monday trial: EP1841268, which is a divisional of the patent originally asserted in Mannheim, and German patent DE19910239, which is the German origin of this patent family. IPCom didn't assert those two patents in the original Mannheim case but added them, in accordance with Article 145 of the Patentgesetz (German Patent Act), in the appellate proceedings. HTC opposed IPCom's March 31, 2010 addition of the divisional patent, but the appellate court declared it permissible. 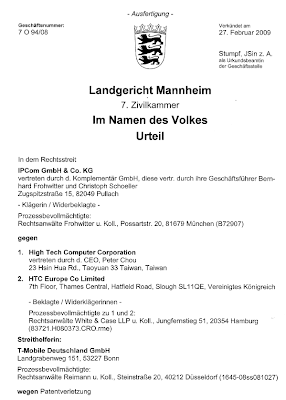 On December 23, 2010, IPCom also threw in the original German patent. HTC didn't even try to oppose that one. By withdrawing the appeal, HTC avoided a formal decision on those two additional patents. As a result, if IPCom wanted to enforce those, it would have to go back to a first-instance court for that purpose. The defendants in the case today's news relates to were HTC Corporation of Taiwan and UK-based HTC Europe Co Limited. Also, T-Mobile temporarily intervened, but it withdrew its independent intervention at the appellate stage. IPCom is separately suing T-Mobile and (in yet another proceeding) Vodafone over this patent. Those actions are taking place in Düsseldorf. Those are Germany's two leading carriers and presumably HTC's most important resellers in this country. HTC can't simply circumvent the ruling by using other legal entities of its corporate group to do business in Germany. It could try, but it would be liable. The other essential claim, claim 2, was upheld by the BPatG as granted. Claim 11 was, as I explained above, narrowed by way of an amendment proposed by IPCom, but IPCom still hopes to defend the original version of the claim in its appeal before the BGH. It's important to keep those facts in mind when reading the December 1, 2010 announcement by Nokia and HTC claiming that they overturned "two thirds" of this patent. At this stage, IPCom is able to enforce the original patent (since the nullity case isn't over until the BGH has ruled on the appeal) against HTC for years -- without bond (since the infringement proceedings have ended) and without much of a risk of being liable for damages. The patent family at issue in this dispute is valid until 2020. It's not a viable option for HTC to leave the German market until 2020 in the worst case, or for a couple of years in a more optimistic scenario. In light of that, expect HTC to pay up rather soon. Since the patent is considered essential to the 3G standard, IPCom is bound to a FRAND commitment that was originally made by Bosch and reaffirmed by IPCom in a public declaration based on which the European Commission terminated an antitrust investigation of IPCom's practices. But IPCom will enforce its patent until HTC accepts to pay FRAND royalties. Under German case law, this means that HTC must make IPCom a firm and irrevocable offer of FRAND terms based on which it would like to acquire a license. It appears that HTC has not yet done so, or at least IPCom says that it hasn't. On that basis, IPCom can shoot for injunctions. IPCom is a patent holding firm that acquired more than 1,000 patents -- constituting approximately 160 patent families, i.e., different inventions -- from Bosch in 2007. At the time, Bosch was in disagreement with Nokia over the licensing terms for these patents. Bosch was a pioneer in this business. In 1992 I bought my first car phone and a Bosch product using a pre-GSM analog wireless standard was one of the options I considered. But Bosch left this business later, and its patents are now being commercialized by IPCom, which was started by patent attorney Bernhard Frohwitter and received funding from a U.S. private equity fund named Fortress for the buyout of those patents from Bosch. The now-enforceable ruling was handed by the 7th chamber of the Mannheim Regional Court. The presiding judge, Andreas Voß (here's his public profile on XING, LinkedIn's German competitor), was also presiding over two Mannheim hearings I recently attended (Samsung v. Apple, Motorola v. Apple) and will preside over at least some of Motorola's German actions against Microsoft. I'm really impressed with his grasp of technical issues. The Mannheim court is very fast. For example, the complaint that led to the now-enforceable ruling of February 27, 2009 was brought on April 10, 2008. IPCom sought the immediate enforcement of the ruling, but enforcement was suspended pending the appeal. By withdrawing the appeal, HTC enabled to IPCom to press on with enforcement. In 2009, after the first-instance ruling, IPCom already asked the court to find HTC in contempt and to impose sanctions. That process was interrupted only by HTC's appeal and the appellate court's decision to grant a suspension of the enforcement for the duration of the appeal. That process will now resume right away -- at the same point at which it was interrupted in 2009 -- before the Mannheim court.